I read Marie Kondo's book a couple of years ago and redid my closet. It was awesome. (but didn't carry through to the whole house and closet reverted over time to wild state). Just saw the series for the first time and LOVE IT. Letting go of stuff seems like a good first step to becoming unstuck AND doing what brings you joy. Yes! Such a good book. I am with you - I wanted to do the whole house but just tackling my items in the attic/closet/drawers was a week-long ordeal. And it's so hard sleeping in a room that is in disarray. Isn't the show good? I admit that I fast forwarded a lot of it but I love the tips for each of the rooms. I need to go through Zo's closet next. I know there are old snowpants, old school uniorms, and lots he cannot fit. And Mau is too little for me to keep the items for 6 years! I should pass them on and just get what we need for Mau when he is older. I realized I feel most “stuck” when I live the same day over and over again and the same routine so I’ve been reaching out more to old friends to get together for baby dates or brunches - after all I think it was you who suggested stop saying “sorry it’s been too long” and enjoy the relationships you have! Soo glad you resonate with this post. I am so over the push for physician mindfulness without very real changes to the systems that contribute to our burnout! @ those jobs that brag about "high producers" - that is truly worrisome! I bet if you talk to the "high producers" and the "low producers" alike, they are all burnt out :-( Sadly - the administrators just don't seem to get it. Did you know burnout is a term that was first coined in the 70's to describe end stage drug use? No, I didn't know that? Can you please share your source? Yes! I know about her work. I have applied to one of her scholarships - I unfortunately cannot afford her retreats. Her work is so very important. I should have included that in my list :-( Ahhh - I forgot!!! 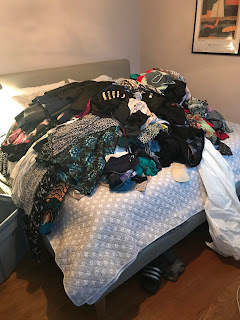 Cleaning out your closet is a great thing to do to to make more space and make you feel like a job has been well done but it would not be my first thing to do when feeling stuck in the world of "successful providers". First step is to ask yourself what is most important to you??? Make a list: Be with kids after school, exercise X times a week, finances, more house, time to sit and read alone, see the world etc.. Then, decide how much of one you can give up for another. My choice was to be home with my children and enjoy my patients and I have sacrificed on the financial side for this freedom. . I am not the most "productive" physician when it comes to finances but the trade off was my choice and that is having time to raise five children and spending time with my patients. This has worked for me for the last thirty years. Of course life changes, kids grow up etc. and you might rearrange goals with time. I think the biggest challenge for most physicians stuck in medicine is lack of good role models because everyone is complaining and there is no one who is happy and handling things well. Often, physician think that being stuck is the new norm and continue to deal with. When I made a major change to unstuck myself, I had no role models. It was very challenging but my sanity, self-respect and passion for integrative medicine was my top priority. Hence I took the leap of faith. Clearly faith in oneself is the second most important variable in getting unstuck. Those are very important points you are making! When I made the jump from academics, I looked around and literally every single one of my role models in medicine was burned out. I was like - if I keep doing this, this will be in a year tops! These women were balancing families with academic jobs in a major academic center, taking their computers on vacation, getting snarky emails from admin about not closing their notes, and had tacked on tons of administrative tasks without being compensated nor promoted for it. My husband and I checked in regularly and honestly if it wasn't for him calling out the hypocrisy I never would have been brave enough. He kept saying "this is abuse! This is unsustainable! You didn't work this hard to do this!" Please share more about what you did - AND HOW ARE YOU PAYING IT FORWARD? Are you now a mentor for other docs? I know the American Academy of Pediatrics has some new programs and are looking for career mentors. Shoot - I need you as my mentor!!! Email me!